In the summer of 2010, as an experiment, I painted the same scene twice. 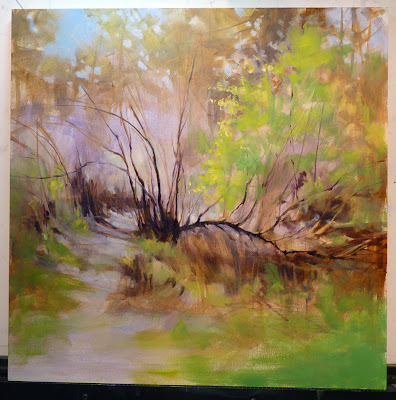 The first painting, "Summer Sojourn," went to a gallery and on to a new home. 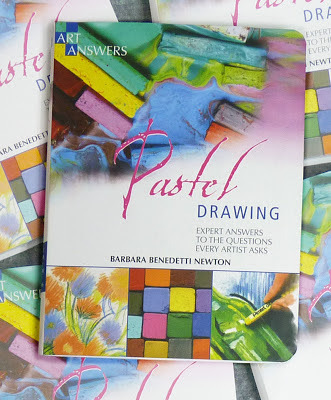 It is also published on page 211 of my Art Answers: Pastel book. Today, I brought the second version out of storage. 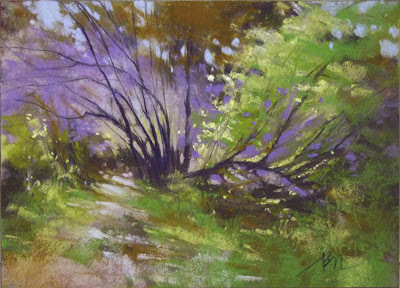 "Summer Sojourn II" was an experiment in process vs product and has some exciting foundation work showing through the pastel. Click on the title above, then click on the image and see the upper right corner. I started to unframe this painting to post it on my Studio Sale blog for the month of June but halfway through I thought, why not just sell it framed? Image size 9x8, frame size 15x13, Nielsen German Silver metal frame with white archival mat and glass. For purchase information, click on the Studio Sales link in the sidebar. Yesterday, I received the first copies of my book! It was a unique project with my part completed in record time. One morning in mid August of last year, I made a new folder for my computer desktop labeled "My Book." I had been thinking for some time about self-publishing a book of my work with a few step-by-step demonstrations. In the folder, I filed links, ideas, and images of my work. Within 30 minutes, I received an email from Quantum Publishers in the UK asking if I would be interested in authoring a pastel book for them! I just sat in awe, looking at that email. I wasn't familiar with Quantum and I still don't know why they contacted ME. But, I was happy that they did. It sounded like an interesting project: Quantum has published pastel books in the past and they wanted someone to compile text and images from existing books into a new book for their series called Art Answers. I needed to come up with 200 questions about pastel in 30 days. I could do that! Very quickly, I learned that not only did I have to submit the questions BUT ALSO THE ANSWERS in that short time period. Quantum air-mailed the existing books to me and I began to work on this huge puzzle: first, start with one of my questions, then read through four existing books and answer the question by combining existing text and images for artists in both the UK and the US. I also wrote new text illustrated with my images for many of the questions. I love this little book! From the four existing books, I had the opportunity to include previously published images of artists whom I admire - Sally Strand, Kitty Wallis, Doug Dawson, Jackie Simmonds, Carole Katchen and others. 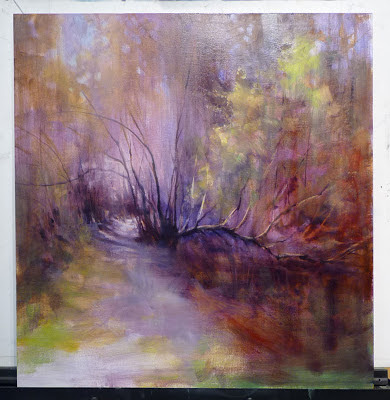 I was also able to give a shout-out to Artist's Air and Paula Ann Ford on page 45 for the question, "Are there health concerns when using pastel?" 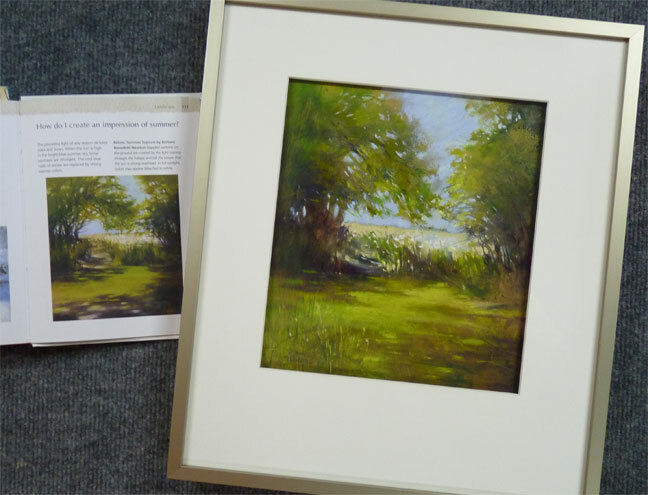 and to introduce Terry Ludwig Pastels to UK artists. While typing this post, I have gone through the book page by page. I must point out that this is a book of information, not a book of beautifully reproduced images. The color of my paintings in this book motivates me to return to the "My Book" folder to self-publish a book! Many thanks to the folks at Quantum and Barrons for this opportunity. Purchase Information. May 10th, I posted "Young at Heart" in progress and after 12 days of painting and pondering, I'm calling it done. 24 x 24 inches, oil on wood panel. 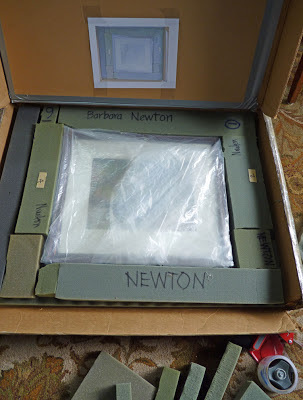 I LOVE my good old Airfloat shipping boxes and this morning I am using them once again to ship a couple paintings to the IAPS show. Over the years, the various sizes of art I've shipped has resulted in foam pieces of all shapes and sizes. I have often thought about the person who has to redo this packaging puzzle to send my work back to me at the end of the show. 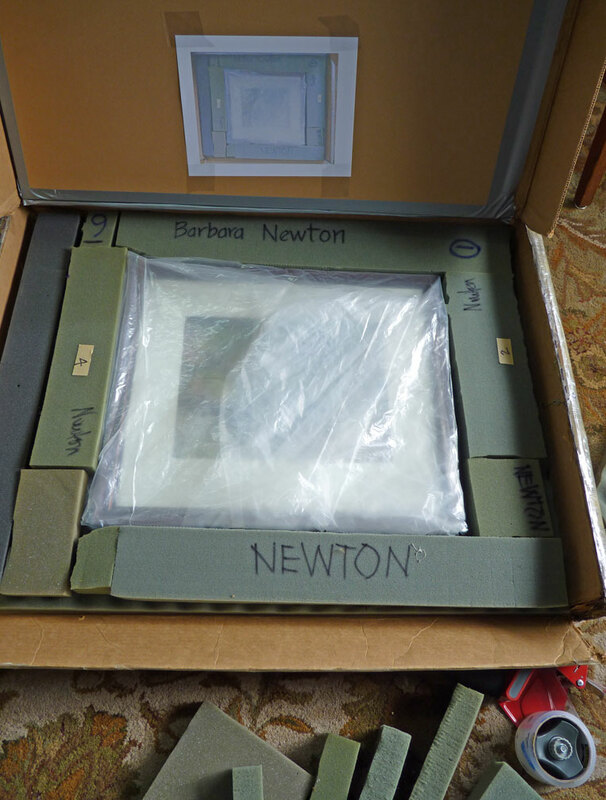 To make their job easier, I take a photo of how I put the foam and art puzzle together and tape the photo to the inside of the box for their reference. When I teach, I encourage my students to make thumbnails but I usually forget to make them for myself. 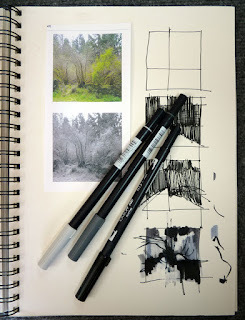 My workshop with Lorenzo Chavez last week was a thumbnail reminder to block in composition shapes with several values. Before going back to my 24 x 24 inch oil in progress, I revisited the composition and values as shown above in my sketchbook. Back at the easel, I mixed a thin oil wash of Alizarin Crimson and Ultramarine Blue and brushed it over all but the lightest areas in my painting. Note the mixture is warmer (more red than blue) in the right front and cooler (more blue than red) as the scene moves into the background. I have a tendency to rush toward the detail in a painting before I should. This painting is better already. Thank you, Lorenzo, for making me paint right over my precious details while at the workshop. 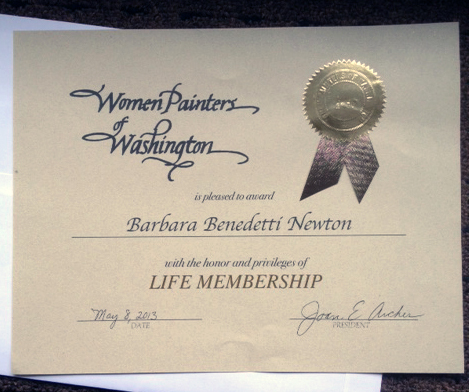 Yesterday I received a very special honor: Life Membership in Women Painters of Washington. Thank you WPW! This distinction is given in recognition of outstanding service to the organization. 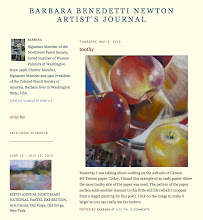 My 15 years working with the members of WPW has been rewarding to me in so many ways; I encourage women painters in the state of Washington to apply for membership. I had hoped to post the finished oil version of "Young at Heart" by now but the past week has flown by. 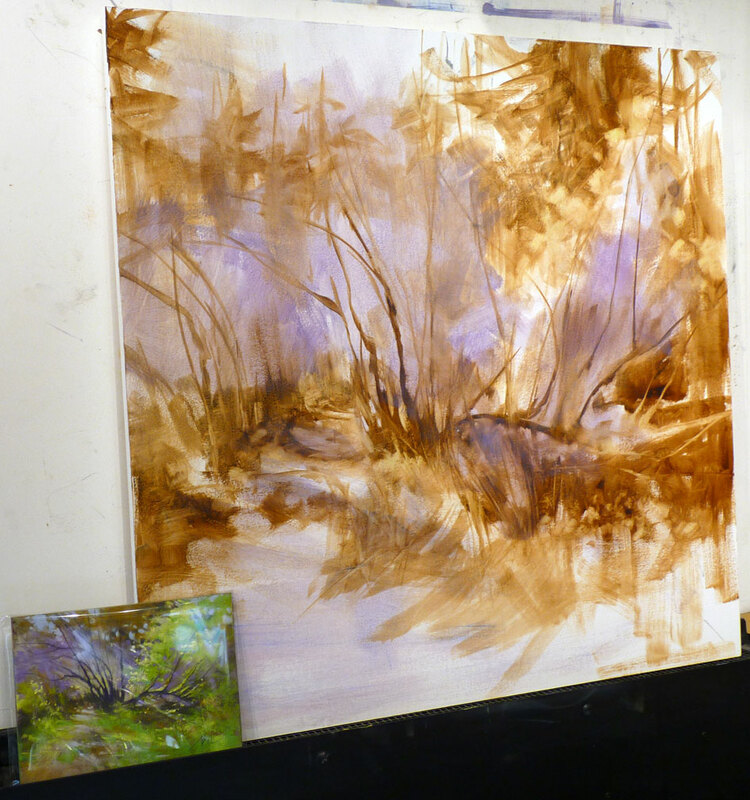 I rarely take workshops but I spent three days last week in one instructed by Lorenzo Chavez and I'm glad I did. He is a kind and thoughtful instructor. His enthusiasm for thumbnails has reminded me how important they are. 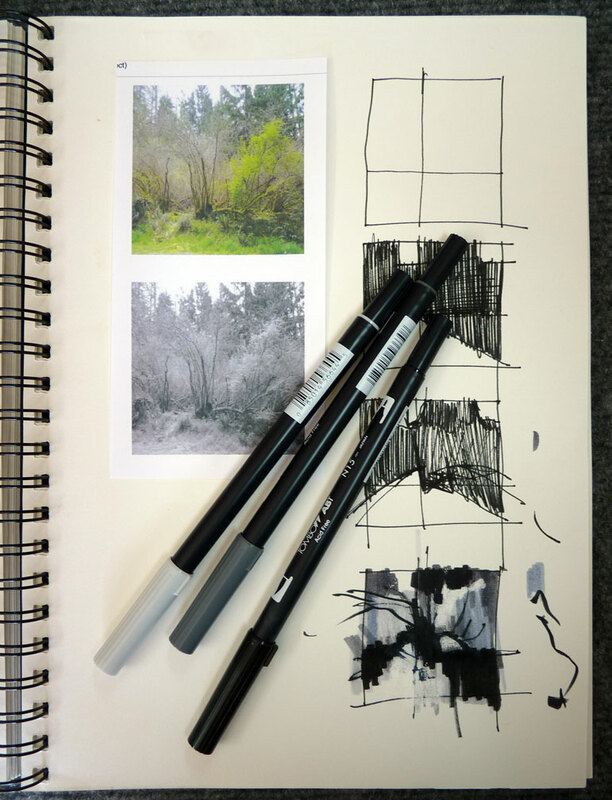 He clearly communicated how to simplify our compositions and how to block in different planes (sky, uprights, ground) with the correct value (especially useful when working plein air). 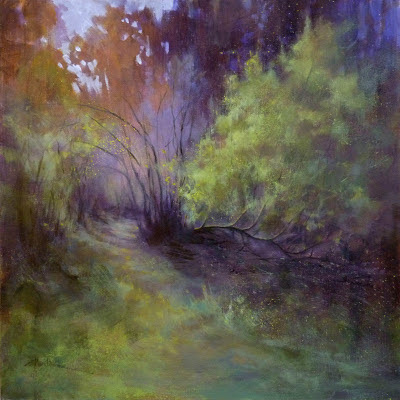 Saturday, while I was judging the Miniature Category for the Edmonds Arts Festival, my painting, "Arboretum Winter Color" was receiving a Juror's Award from Mr. Chavez at the Northwest Pastel Society's 27th International Open Show at American Art Company, Tacoma, WA. We've had unseasonably warm weather here in Washington state. Spring is bustin' out all over so weed-eating is back on my agenda. 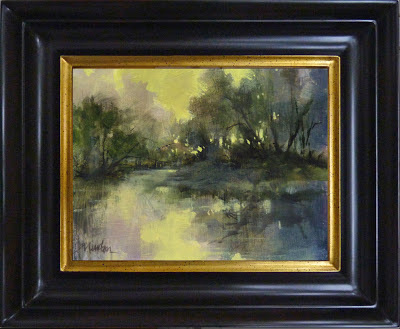 And, last but not least, my 5x7 inch pastel color study "Young at Heart" is in its last days of auction at Daily Paintworks. "Young at Heart," 24 x 24 inch oil is coming along. I'll pause again for a few days to reflect on this. Ahhh...that helped move me forward. I enclosed the pastel color study in a poly sleeve (whichever poly this is, it doesn't create static) and kept it beside me as I added lavender oil paint.